Broadmead Village is a highly sought after and well established development about 2 miles north of Folkestone town centre and convenient for local schools, out of town supermarkets and sports centre. Two main line stations, Folkestone Central and Folkestone West, are within approximately ten minutes level walk and from where the High Speed Link service to London, St Pancras is available (journey times of around 53 minutes). The M20 (Junction 13), the Channel Tunnel Terminal and Ferry Port of Dover are all within easy reach. The Leas Promenade with pleasant walks, fine views of the English Channel to France, bandstand and concert hall, is also only a short walk away and from where paths lead down to the long stretches of shingle beach, coastal park and the recently revitalised Harbour Arm with champagne bar, live music etc. There are a number of good schools in the vicinity, including boys' and girls' Grammar schools. The Cinque Ports Town of Hythe, approximately 4 miles distant, provides a wide range of amenities including 4 supermarkets (including Waitrose, Sainsburys and Aldi), various independent shops and restaurants, together with a selection of sports and leisure facilities, golf courses, swimming pool, etc. (All times and distances are approximate). 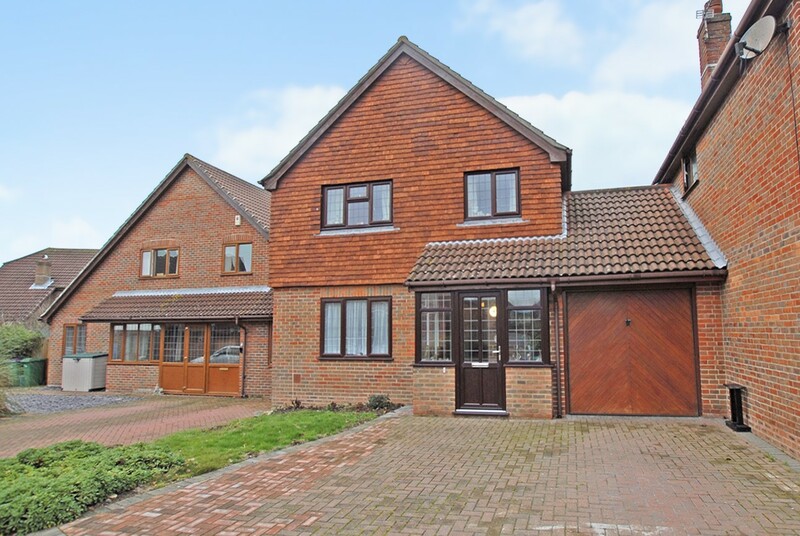 This link detached house forms part an attractive cul-de-sac comprising similarly appealing properties. It appears to have been well maintained and recent improvements have included an updated kitchen, new contemporary shower room and installation of a front porch. The accommodation comprises an entrance hall, sitting room with door leading to a separate dining room and to the well fitted kitchen. There is a useful utility room and a cloakroom also on the ground floor. The first floor comprises 4 generous bedrooms and a family bathroom. The property also benefits from a driveway and garage. There is a well enclosed and easily managed garden to the rear.